Visit a magical circle of rocks, fossils and minerals; experience the wonder of travelling back in time. What was it like to be there when each rock formed or when each organism was alive? 1. obelisk to celebrate the local famous building stone, Box Ground, one of the best of the 'Bath Stones' and much used to build the City. It is Jurassic oolitic limestone. 2. four quarry blocks plus the obelisk show Britain’s plate tectonic movement through time from south of the equator about 425 million years ago. 3. two climbing blocks. One is made of sedimentary rocks, fossils and minerals and the other is made of crystalline rocks (igneous and metamorphic rocks). These are primarily for teaching purposes and fulfil the requirements of the KS2 and 3 Science National Curriculum. They were also designed so that little children can climb over them. 4. fossil rubbing block which has casts of real fossils set within the two sides. The block is made of the local Jurassic oolitic limestone. 5. two sets of dinosaur footprints within the circle. These are accurately sized and spaced so that you can work out approximate height of the animals and whether they were walking, running or trotting. 6. the black and red marks on the granite setts around the edge of the circle show the first appearances of animals and plants since the origin of the Earth, 4.6 billion years ago. Details of this can be seen on the website. 1. 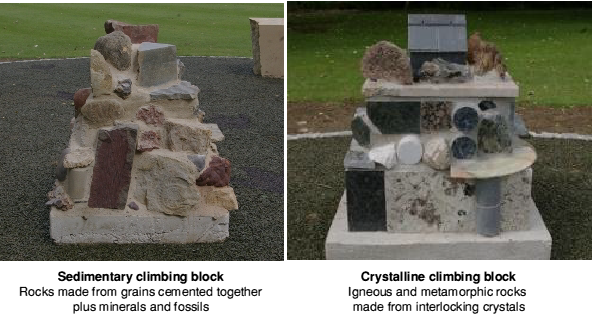 Which two quarry blocks are made of the same rock type? 3. At N51°25.029 W002°15.300 , find a face (Mr. Hardyse on the sedimentary climbing block). What are his eyes made of? 4. Also at N51°25.029 W002°15.300 How many ammonites can you find? 5. At N51°25.029 W002°15.300. there are two large fossils on the top. They are both Nautilus. The one on the right is a cross-section in which you can see the internal divisions of the body chambers. The creature lived in each chamber before it grew the next chamber. After this creatures died, another tiny animal crawled into the last body chamber where it subsequently died. It is about 3cm long. What is it? You can just describe what you see. 6. At N51°25.030 W002°15.299, there is a small slate house (crystalline climbing block). Why is slate used as a roofing material? 7. Near the slate house, there are some rocks with holes in. How were these holes made? 8. At N51°25.028 W002°15.296, look at the two Pterodactyl fossil casts. How do they differ from modern birds? 9. If you look closely at the fish fossil cast also at N51°25.028 W002°15.295, there seems to be a bit of a muddle in its body cavity area. But if you look carefully you can see little round shapes. What do think these could be? The fish is about 50 million years old. 10. The black mark behind the obelisk ( N51°25.028 W002°15.299) represents the origin of the Earth, 4.6. billion years ago. Walk clockwise from here to N51°25.026 W002°15.292 What occurred at this black mark? Why was that event so important to life on Earth? 11. What happened at the red mark at N51°25.026 W002°15.299. 12. Record the co-ordinates for when modern man appeared. 13. Go to N51°25.025 W002°15.296, measure (or estimate) the dinosaur foot length. Multiply foot length x 4, and you will get the hip height of the animal. How tall do you think it was? 14. What is the story of these two sets of dinosaur footprints? Was the big one a carnivore which ate the little one? What do you think?